What is there to say about Adams's masterpiece other than simply wow? Watership Down is like reading a grown-up version of Kenneth Grahame's The Wind in the Willows. It tugs on your heartstrings as you follow Hazel, Fiver, and their friends across the English countryside. This incredible piece of literature will leave its mark on you long after you have read the last words, and is a remarkable eye-opener to the evils of human society. 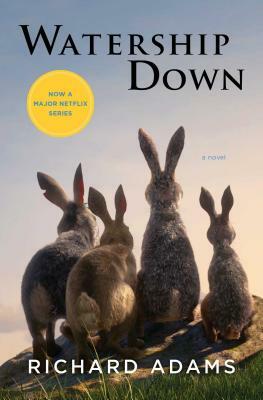 A worldwide bestseller for more than forty years, Watership Down is the compelling tale of a band of wild rabbits struggling to hold onto their place in the world—“a classic yarn of discovery and struggle” (The New York Times). Richard Adams’s Watership Down is a timeless classic and one of the most beloved novels of all time. Set in the Hampshire Downs in Southern England, an idyllic rural landscape, this stirring tale of “suspense, hot pursuit, and derring-do” (Chicago Tribune) follows a band of rabbits in flight from the incursion of man and the destruction of their home. Led by a stouthearted pair of brothers, they travel forth from their native Sandleford warren through harrowing trials to a mysterious promised land and a more perfect society. “A marvelous story of rebellion, exile, and survival” (Sunday Telegraph) this is an unforgettable literary classic for all ages. "Spellbinding...Marvelous...A taut tale of suspense, hot pursuit and derring-do." "Quite marvelous...A powerful new vision of the great chain of being." “A classic yarn of discovery and struggle."